Give A Name Plate As A Graduation Gift! Not sure what to get your favorite budding professional? Whether your niece is fresh out of law school or your son just became a doctor, graduation season is upon us. It’s increasingly difficult to find gifts that are meaningful, functional, and beautiful at the same time. When that young professional gets hired, they’ll probably get their very own office. One of the most beautiful gifts you can get for your recent grad is a wood name plate that shows off their name and new profession in style. But with the thousands of name plates to choose from, which one should you get? At Namepates.biz, we offer the highest quality wood name plates on the market. 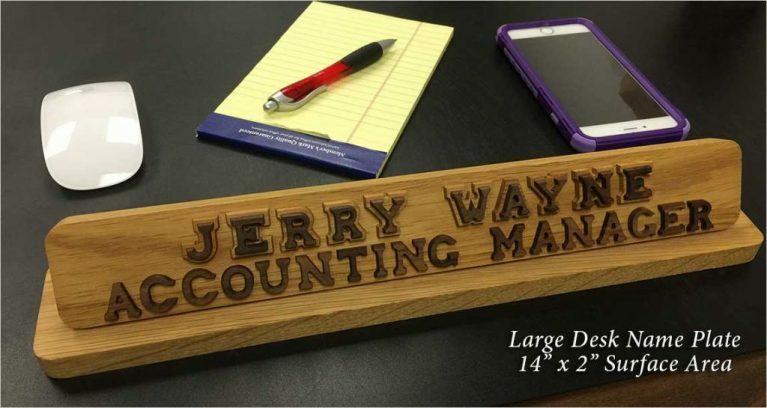 Our name plates come in all different sizes and are made of quality hard wood. This is great because you know your gift will last a long time. Unlike cheap plastic and metal name plates, the ones at Nameplates.biz are made right here in the USA with the highest quality materials. All the wood products we work with are treated with a lemon oil finish that helps preserve the wood. Our dark walnut letters stand out against the oak background, which ensures that your recent grad’s name will be the most visible part of the name plate. We also let you decorate your name plate with symbols that pertain to many different professions, like law, pharmacy, and medicine. That way, instead of including a job title that may change, you’ll have a nameplate that stays current with all the potential title changes. The name plate is so unique that it will not only get noticed, it’ll start conversations. Imagine how beautiful your graduate’s office will look with the gift of a custom name plate. Start creating your graduate’s name plate online today! You can drag letters and symbols on the screen to create a nameplate that will look exactly that way when you receive it in the mail. Don’t give an impersonal gift card this year. Give that grad something unique and beautiful! If your party is sooner than later, give Nameplates.biz a call at (806)-765-9901. We’ll work with you over the phone to get your order expedited as fast as possible. Order your name plate today!